Ovary, Epithelium - Hyperplasia, in a female F344/N rat from a chronic study. There is proliferation of the surface epithelium of the ovary. 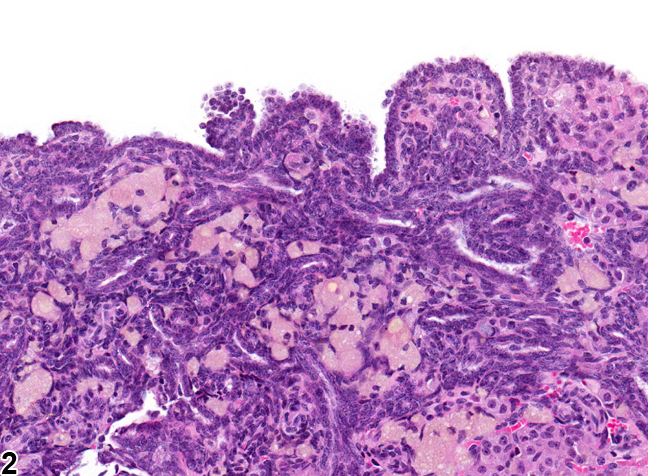 Ovary, Epithelium - Hyperplasia in a female F344/N rat from a chronic study (higher magnification of Figure 1). There is proliferation of the surface epithelium of the ovary. Proliferation of the epithelium lining the surface of the ovary appears as small polypoid projections from the epithelial surface and as downgrowths of cords of cuboidal epithelium cells with basophilic cytoplasm ( Figure 1 and Figure 2 ). 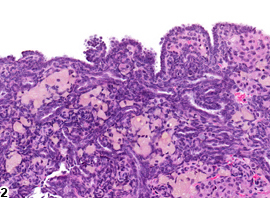 Epithelial cell hyperplasia is thought to be derived from the mesothelium lining the ovarian surface. 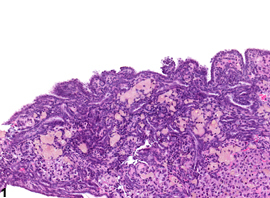 In the past, this has been referred to as germinal epithelium but the term "germinal epithelium" is misleading, because the epithelium covering the surface of the ovary is a continuation of the peritoneum. Epithelial cell hyperplasia must be distinguished from adenoma, cystadenoma, and tubulostromal neoplasms and from tubular (Sertoliform) hyperplasia, which consists of tubules lined by columnar cells with indistinct cytoplasmic borders and basal nuclei. 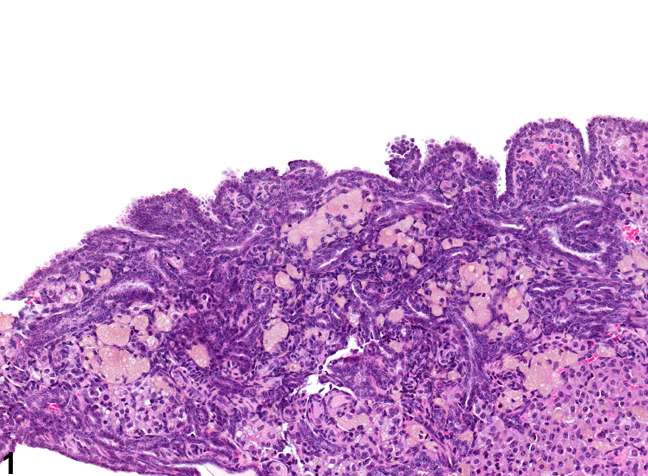 Ovary, Epithelium - Hyperplasia should always be diagnosed and given a severity grade. Lewis DJ, Gopinath C. 1998. The female reproductive system. In: Target Organ Pathology: A Basic Text (Turton T, Hooson J, eds). Taylor and Francis, London, 407-428. National Toxicology Program. 1989. NTP TR-362. Toxicology and Carcinogenesis Studies of 4-Vinyl-1-cyclohexene Diepoxide (CAS No. 106-87-6) in F344/N Rats and B6C3F1 Mice (Dermal Studies). NTP, Research Triangle Park, NC. National Toxicology Program. 1993. NTP TR-434. Toxicology and Carcinogenesis Studies of 1,3- Butadiene (CAS No. 106-99-0) in B6C3F1 Mice (Inhalation Studies). NTP, Research Triangle Park, NC. Young B. 2014. Female reproductive system. In: Wheater’s Functional Histology: A Text and Colour Atlas. (Young B, Woodford P, O’David G, eds). Elsevier, Philadelphia, PA, 351-382.